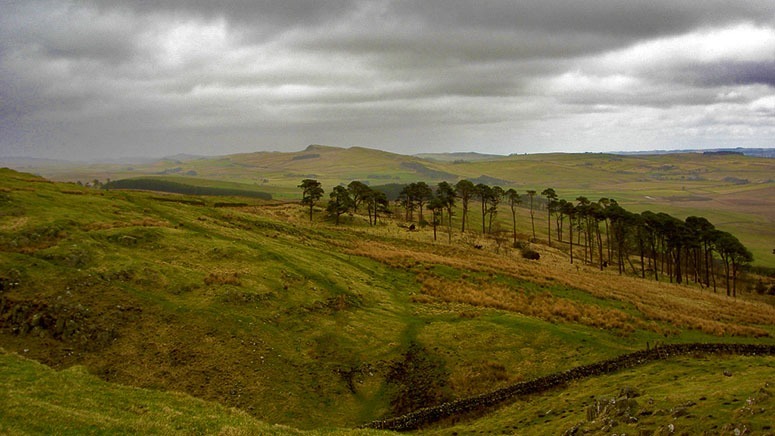 Is the north east of England desloate? Tory peer Lord Howell annoyed the north of England today with his comment on where fracking should take place. He does not want it near his home, in the south of England but believes that England has “large and uninhabited and desolate areas. Certainly in part of the North East where there’s plenty of room for fracking, well away from anybody’s residence where we could conduct without any kind of threat to the rural environment.” People with “residences” in the NE were offended and he had to apologise. But he could have made a sensible point: ‘If fracking is to take place in the UK it should start in areas of low scenic quality and low population density’. Who could argue with him? But it would then be necessary to find out which areas ARE of low scenic quality and, I am sorry to say, the UK landscape architecture profession appears to be ducking this question. This entry was posted in Landscape Architecture, landscape planning on 30th July 2013 by Tom Turner. The PPS.org comment on St James’s Park is as follows: This wonderful park is a spiritual place, and far and away the best park in the heart of London… It sits between Buckingham Palace and Whitehall with great views to either side. It is spiritual place, and far and away the best park in the heart of London. Its only real rival is Queen Mary’s Gardens, which has many similar qualities, but is buried deep in Regent’s Park. Personally, I do not see Queen Mary’s Gardens as being either the same type of space or half as good as St James’s Park. But we could do with a reliable assessment system for the quality of Public Open Space POS. This entry was posted in Garden Design on 27th July 2013 by Tom Turner. “Take care with whom you joke” was my grandfather’s advice AND I SHOULD HAVE LISTENED TO HIM. I published the above b&w drawing, in a 1998 book City as landscape: a post-Postmodern view of design and planning. The more exciting designs on my diagram were inspired by a TV set and a kettle (and the trees should have been smaller). In 1998, Postmodern architecture was going out of fashion. Every architect wanted to know what the Next Big Thing was going to be. Obviously, this was it. 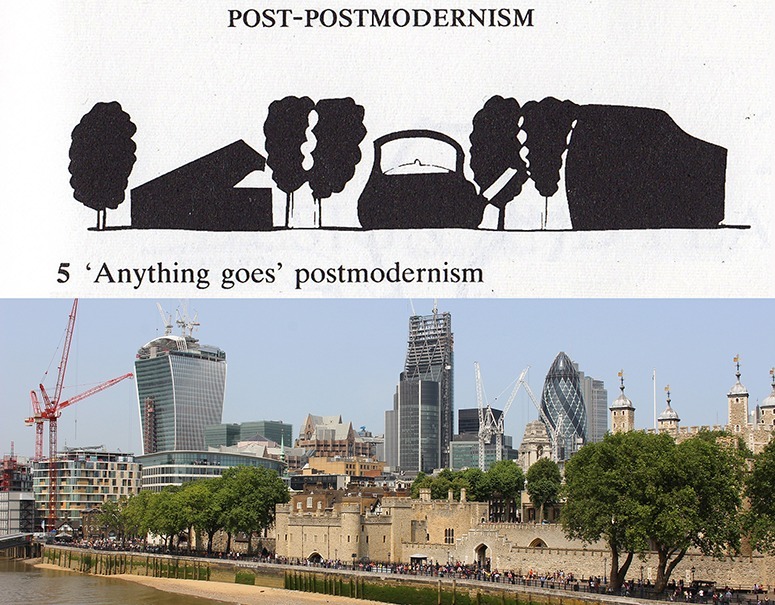 POST-Postmodern was what the architectural world needed. New skylines take a while to plan, design and build. My diagram is now taking shape, beyond the Tower of London, with help from Rogers and Foster. We’ll have to wait a bit for the kettle but the kitchen metaphor has proved highly influential. Rogers’ wife is, of course, a cook. And when I used to walk to work beside one of his first houses (in Wimbledon) I used to watch his parents cleaning their teeth in the office-style uncurtained bathroom window. My photo of the City of London’s emerging skyline shows: the Walkie-Talkie (Rafael Viñoly), the Cheesegrater (Richard Rogers) and the Gherkin (Norman Foster). The Gherkin was OK when it stood alone. But I do not look foward to The Pepperpot, The Toaster and the Wooden Spoon jostling for attention on London’s waterfront. Are the designs inspired by envy at the way bankers cook their books so brilliantly? Simon Jenkins asks Who let this Gulf on Thames scar London’s Southbank? Mayor Boris and recalled the raw greed evinced at the RIBA: Talking towers with London architects is like talking disarmament with the National Rifle Association. A skyscraper seems every builder’s dream. 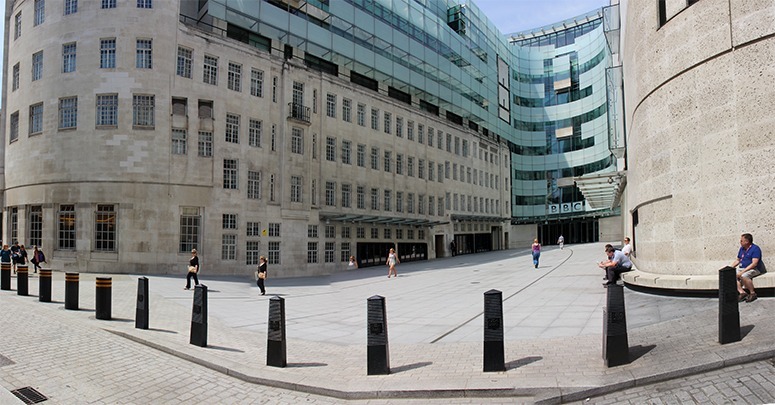 At a Royal Institute of British Architects seminar on the subject last April, I faced an audience almost entirely of architects who treated any criticism of tall buildings as nothing to do with aesthetics or urban culture but to do with denying them money. They played the man, not the ball, accusing critics of being elitist, reactionary, heritage-obsessed and enemies of architecture. To the people of the London I can only say that I am ‘Sorry, very, very Sorry’. I should have kept my diagram in a sealed cabinet. Note: architects have made London’s skyline what it is, for good and ill. My criticism is that they are reluctant to work together for the public good. In design, it is every man and woman for himself or herself. It is not, primarily, a matter of ‘preserving’ the old skyline, except in certain places, and Rem Koolhaas speaks with wisdom on this point: London has always changed dramatically and it is still not a dramatic city… Drama is not what architecture is about but on the other hand I do not see it has dangers for London. This entry was posted in Garden Design on 15th July 2013 by Tom Turner. They are concerned with what Norman T Newton called Design on the land and Geoffrey Jellicoe called The landscape of man. Gardens are better places for exploring design ideas than public landscape architecture, because they tend to be smaller, because they are less utilitarian and because they have private clients who often care more about ideas than impersonal public clients. Design history is a rich source of ideas. But historical designs are best treated as timeless patterns of the kind advocated by Christopher Alexander in his book on The Pattern Language, unless one is doing on historic restoration or re-creation project. I find art-historical categories provide the best approach to the classification of periods in the history of designed gardens. But nationalistic and dynastic categories also have their uses. This entry was posted in Garden Design, Landscape Architecture on 6th July 2013 by Tom Turner.